Tax benefits for living in Nebraska. 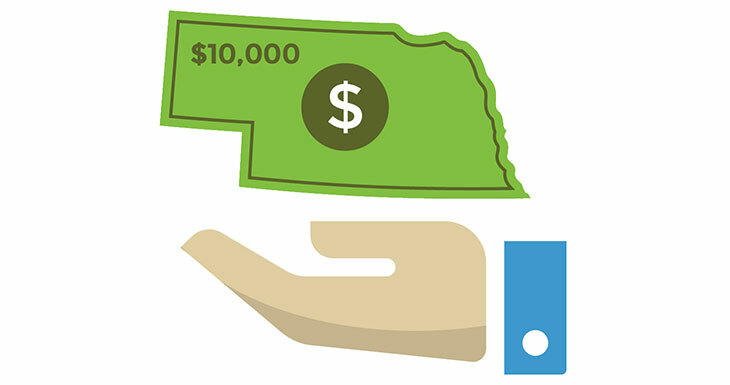 Account owners are eligible to receive a Nebraska state income tax deduction of up to a maximum of $10,000 ($5,000 if married, filing separately) for contributions they make to their own NEST accounts.1 Contributions in excess of $10,000 cannot be carried over to a future year. For a minor-owned or UGMA/UTMA NEST account, the minor is considered the account owner for Nebraska state income tax deductions. The minor must file a Nebraska tax return for the year their contributions are made to be eligible for a tax deduction for their own contributions. In the case of a UGMA/UTMA NEST account, contributions by the parent/guardian listed as the Custodian on the UGMA/UTMA NEST account are also eligible for a Nebraska state tax deduction. Both the contribution and earnings portion of funds that were deposited (rolled) into a NEST account from a non-Nebraska 529 plan are eligible to receive the tax deduction. Contributions made to another state's 529 college savings plan are not deductible from the Nebraska state income tax. Grandparents can only take a tax deduction for contributing to their own accounts. Grandparents cannot claim a deduction if they make contributions to a grandchild's account owned by the parents. To take advantage of the Nebraska state income tax deduction, your contribution needs to be reported on your Nebraska state income tax return and postmarked by December 31st or submitted electronically online by December 31st before 10:59 PM CT of that year. 1 Nebraska state tax deductions are subject to recapture to the extent previously deducted by the account owner, if you cancel your Participation Agreement, make a partial or complete non-qualified withdrawal, or roll assets to another state’s qualified tuition program.